Well, since I'm starting to get backed up on Thai restaurants I need to review, I might as well get one of them out of the way. Pad Thai House has become a favorite over the last several months, not just of mine but my roommate, my mother, my sister, my sister's boyfriend, etc. They were one of those places I drove by a million times and never stopped at until my loved ones basically held an intervention to get me there. Sometimes visiting a place a half dozen times in a few months makes reviewing them tricky, because I don't really recall my first visit or any anecdotes about it with any real clarity, but by the same token there are usually a lot more pictures to show and dishes to talk about. So let's talk about some food, eh? ...of the same type a lot of Asian restaurants seem to offer, i.e. basically the iceberg mix you find in most grocery stores with a pinkish-peach colored dressing. It's good, but nothing you would order a giant bowl of as your main course. Beats me, and I didn't ask. Once, just once, I received a bowl of tangy, moderately spicy soup. I have no idea what it was, but it was good. I don't know if soup comes with certain items or at certain times of day. 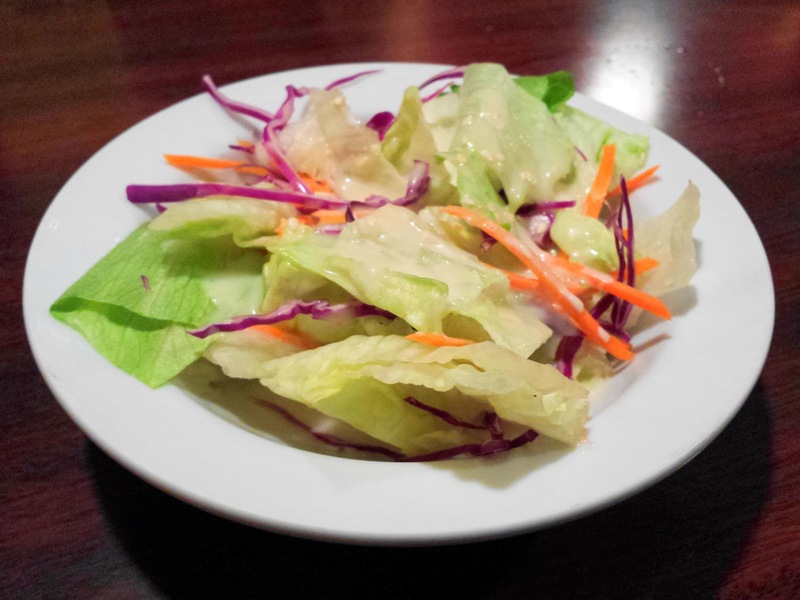 Their lunch menu says you get a side soup of the day, but the last time I was there, they just gave me the salad. For people like my roommate who suffer from what she refers to as "decision-making problems", and people who just want to try as many things as possible such as myself, there is the appetizer combo plate. 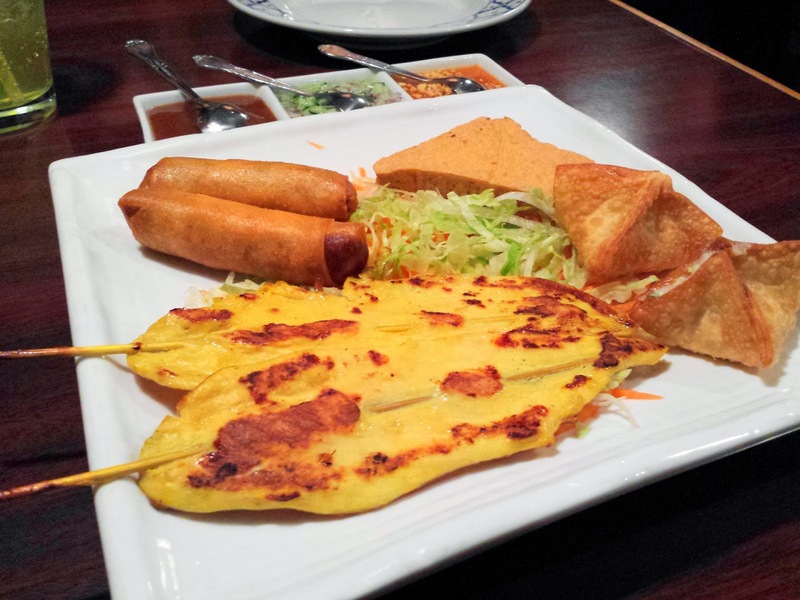 You get two each of: chicken satay, egg rolls, cream cheese puffs (think crab rangoon but sans crab), and deep-fried tofu triangles. This is all very good stuff. Well, I could have done without the tofu. The plate comes with a trio of condiments (basically peanut sauce, cucumber salad and a sweet and sour type plum sauce), so mix and match to find the combinations you like. And then there is my favorite item off the appetizer menu, Cha Yor, a delicious combination of pork, mushroom, egg and noodles wrapped in rice paper and deep fried. Served with lettuce leaves to wrap the chunks of sliced roll in before dipping them in the accompanying tangy chili sauce. One thing that surprises me at Pad Thai House is the kid's menu. Just becuase they're serving children doesn't mean they dumb down the food. 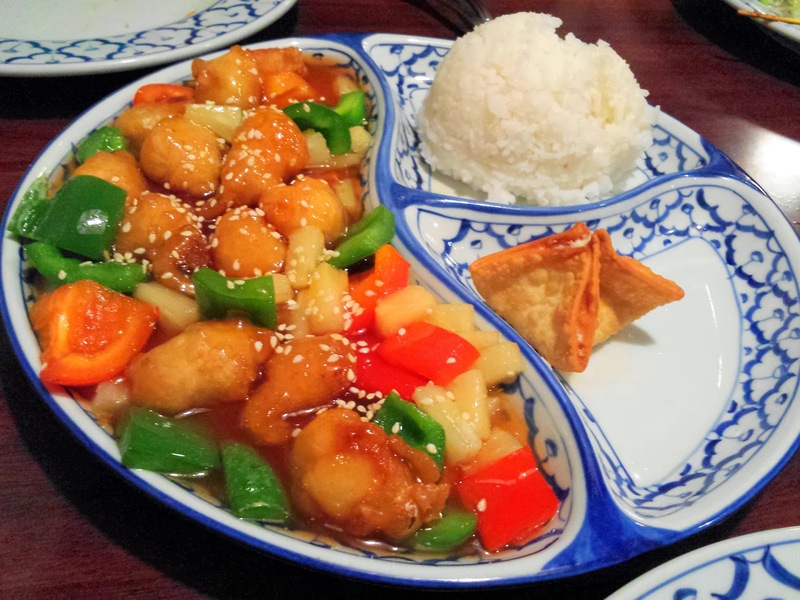 The Sweet & Sour chicken is mixed with just as much bell pepper and pineapple as the adult version, which will likely give pause to kids who are used to the garish version they get at Chinese restaurants that's all breading and bright red sauce. Likewise, the kid's Chow Mein is still stir fried with a fair amount of sprouts, green onion and carrot. The portion may be a bit smaller, but kids automatically get a cream cheese puff and choice of steamed or fried rice. Pad See-Ew has quickly become one of my favorite dishes to order at Thai eateries, even if it isn't really a Thai dish to begin with. It's a comfort food mixture of flat noodles (usually rice), Chinese broccoli, bean sprouts and onions stir fried in a blend of mild sauces. I prefer this dish with egg anyway, but I just plain don't like Pad Thai House's version of it. The sauces are too mild, to the point of having no real discernible flavor. Your only real option is to up the spice quotient, which just serves to further unbalance the dish since you're getting heat and pretty much nothing else. If you like this dish, there are better places to get it. Ah, Pad Thai. The California Roll of Thai cuisine, the gateway dish that many people never venture away from. Normally, I can't stand it. It's definitely more adventurous than most Asian dishes that catch on in this country, maybe because people don't question what's in it much (I know a lot of people who are repulsed by fish sauce when they encounter it on its own). Tamarind gives Pad Thai its distinct tangy flavor, palm sugar provides the sweetness, and it's just that overwhelming tangy/sweet combination that puts me off most of the time, though I've been given to understand that those elements have been played up for Western audiences and are traditionally much more subtle. Pad Thai House has struck a pretty impressive balance with theirs, so much so that it's pretty much all I ever order there. Hell, it's pretty much all everyone I know over the age of twelve orders there. A word of warning though, the heat level is VERY inconsistent. There have been days where I've ordered level 2 and had to pace myself so I didn't feel like my mouth is on fire, and other times I've had a 3 and ended up wishing it was just a little hotter. My advise is to err on the side of caution; there are plenty of delicious, spicy things available to add to your food. 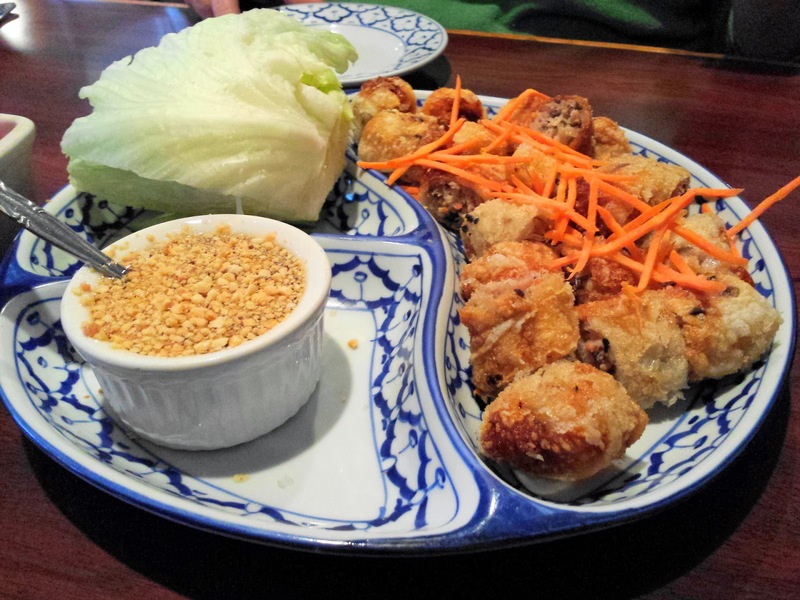 This is our go-to Thai here in the Meridian area; I think far better than Sa Wa Dee. My wife likes the green curry, and I've had most of the other rice and noodle dishes...it's excellent. I agree the heat can be inconsistent, so I order medium for the wife, and Thai hot for me, and we're usually pretty happy.